How to Charge Clients for Late Bookings/Meeting Room Cancellations. Booking cancellations and related policies are only applicable to confirmed bookings and allow you to manage situations when your customers no longer want to go through with a booking. Cancellation Policies allow you to still charge customers who cancel late. This article explains how the booking cancellation process works within Operate. How to Cancel a Booking? There are two ways to cancel a booking: From the Operator side, where your staff can process the cancellation; or from the Client side (the Portal) where your customers can cancel themselves. To cancel a booking from the Operator side, simply select it on the Calendar then click the Cancel button. 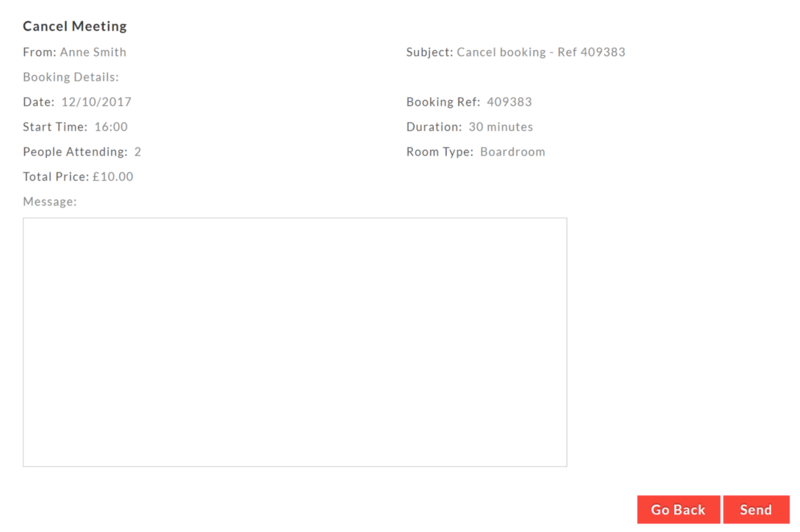 To cancel from the Portal, go to My Meetings in the top menu then select View Bookings. Here is where you will find all bookings corresponding to your account. Click the Cancel button to proceed. Verify the cancellation information and add a message for the Operator. Click Send when ready. The cancellation can be subjected to your cancellation policies. Please see below for more information on setting them up. Cancellation Policies represent a way to ensure your bookings are being charged for if the customer decides to cancel at a date that is too close to the booking. Through Operate's Cancellation Policies feature, you can choose to charge a certain percentage of the booking fee for a particular product group or client type, if the cancellation is made within a number of days prior to the booking. An example Cancellation Policy could be to charge 50% of the booking fee if an external client cancels a meeting room booking 3 days before the booking. How to Configure Cancellation Policies? You can add and update booking cancellation policies under Settings > General > Customize > Calendar > Cancellation Policies. Add a new policy by clicking New. Select the Product Group that you want the Policy to be applied for. Select the Client Type for which you would like to apply the policy - If you have more than one Organization configured within Operate, each client type will have the name of their corresponding Organization added in front of them. Read more about client types. Choose the number of days before the booking date when the policy should apply, If a booking cancellation is made within this interval (e.g. 3 days before the booking date), then the percentage charge you add below will be invoices to the customer who cancelled the booking. Add a percentage of the price that will be retained if there is a cancellation within the number of days you have set. Save your changes to list your new policy. You will need to repeat this process if any of your policy criteria changes. For example, if you want different percentages applied for different intervals (e.g. 50% at 3 days, 100% at one day); and you also need these charges applied to more than one client type, you need to create a policy for each charge and each client type. The same is valid for product groups. One of the simplest and most commonly encountered scenarios include policies for internal vs. external customers - in which case you may apply stricter policies to external clients, for example. Therefore, you would only need to set your charges for only two client types. To update existing policies, click the pencil icon to edit it directly or select multiple records, then click Update, to change a particular field on multiple records at a time. Use the red “x” or the Delete button to remove a record. How are Cancelled Bookings Being Invoiced? When you cancel, and there is no cancellation policy in place, Operate will ask you whether you want to create a Booking Cancellation Form. At this point, if you want to make any changes to your Booking Cancellation Form, you can edit it right after generation. You do not need to adjust the template, you can just enter your desired information within the existing form. When you have implemented a cancellation policy, Operate will ask whether you want to generate a cancellation invoice. Click 'Yes' to generate a draft invoice which you can send to your customer right away. If you do not approve and send the invoice immediately, it will still be stored within your draft invoices and will be processed during the bill run. Once Operate generates the invoice, you will be asked whether you want to create a Booking Cancellation Form as well. Click 'No' if you do not want to charge the customer for the cancellation. Please be aware that this will not generate an invoice and the cancellation will be made at no charge to your customer. Clicking 'No' bypasses your policies, but Operate will still ask whether you want to create a Booking Cancellation Form; which you can also send to your customer. Please Note: If you click Yes and are not prompted to create an invoice, but you are asked to create a Cancellation Form, this means that your policy has not been applied. Please see the information below and investigate what the case may be. If this occurs, you will need to create an invoice for the cancellation charge in question, according to your policy. Select the Correct Product Group - The Product Group you select on the Cancellation Policy needs to be the one within which you have included the space being booked. If your policy is not being applied, go to Space > Products, find the space for which the policy has not been applied and check whether it belongs to the Product Group selected within your policy. Choose the Correct Client Type - The customer who has cancelled the booking needs to be assigned the client type you have selected in the policy. Assign the Client Type to the Booking Location - The Client Type you select when creating the policy will need to be assigned to the Location that includes the spaces being booked. Read more on assigning client types to locations.